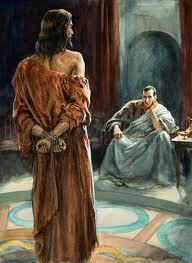 Did Christ and Pontius Pilate Need an Interpreter? This is an Easter digression from the usual topics of this blog. One of the lesser mysteries of Easter is the language in which Jesus Christ and Pontius Pilate conversed during their famous confrontation as reported in the New Testament. It's an old question and there's an ample literature about it both in the form of publications and of blog comments -- and controversy (see Sources below). I was unaware of how much controversy until I came to do the research for this post. But let's take a quick look at it in the perspective of this blog. People assume that because Jesus was Jewish he must have known Hebrew, and because Pilate was a Roman he must have spoken Latin. That's no doubt true but it's a misleading simplification. Because both of them were bilingual (or multilingual) like most of the people in their respective communities. The problem is that on the face of it their languages didn't coincide. First Pilate. As a Roman 'equestrian' from Italy and prefect of the Roman province of Judea, he had to know Latin, the official language of the Empire. Yet it may well not have been his first language. Because by his time Latin had been overtaken for conversation in everyday life by Greek. Not Classical Greek but the dialect that had permeated the Middle East and even Rome since Alexander the Great's conquests in the fourth century BCE: Koine. On the other hand, he is known not to have been sympathetic to his Jewish subjects; according to the Jewish historian Joesphus, he repeatedly caused trouble because of his insensitivity to Jewish customs. So it's unlikely he took the trouble to learn their language. As for Jesus and all the native inhabitants of Judea, their everyday language wasn't Hebrew. Since the time of the exile to Babylon in the sixth century BCE it had been overtaken by another much more widespread Semitic language, Aramaic. There are still pockets of Aramaic speakers in Syria, or there were until the current conflict. I support the consensus view that as the child of humble parents, he spoke it as his mother tongue, and he continued to use it. Hebrew, however, was by no means out of the picture. Above all it had remained the religious language of the Jews, as it still is. It was the liturgical language, the language of the Old Testament and the language of disputation among the scribes and rabbis. As an orthodox Jewish male, Jesus would have been taken by his father to the synagogue from an early age and given a thorough grounding in it. Later he would need it for disputations. "Benjamin Netenyahu and Pope Francis appeared to have a momentary disagreement. 'Jesus was here, in this land. He spoke Hebrew,' Netenyahu told the Pope at a public meeting in Jerusalem. 'Aramaic,' interjected the Pope. 'He spoke Aramaic but he knew Hebrew,' Netenyahu shot back." Thus far we seem to have two bilinguals confronting one another without a common language. But there remains one more possibility. Did Jesus, like Pilate, speak Greek? Koine Greek was widely used in the Palestine of Christ's time. There were Greek-speaking communities in Galilee, including one not far from Jesus' home town of Nazareth, and there's evidence in the New Testament that he spoke it on occasion. This, then, is the likely solution: the interrogation probably took place in Greek. According to the Gospel of Luke, members of the Sanhedrin, a council of learned men, accompanied Jesus to Pilate, so it can't be ruled out that one of them might have acted as interpreter. However, there's no mention of an interpreter in the Gospels and the recourse to Greek would have made it unnecessary. Even if you're one of the many who don't believe Jesus Christ existed (see Gathercole below), you can read the above as an exercise in historical sociolingistics. Who, what, why: What language would Jesus have spoken? BBC Magazine Monitor, 27 May 2014. Click [here] or go to http://www.bbc.com/news/blogs-magazine-monitor-27587230. Mark D. Roberts. What language did Jesus speak? Why does it matter? Patheos, 2010. Click [here] or go to http://www.patheos.com/blogs/markdroberts/series/what-language-did-jesus-speak-why-does-it-matter/. Mark Ward. Did Jesus speak Greek? theLab, 9 December 2015. Click [here] or go to https://academic.logos.com/did-jesus-speak-greek/. Back in 2010 – time flies – there was a post on this blog about a pilotari, a player of the traditional Valencian handball game of pilota, who had become the interpreter for his team at international matches. (To find it, enter pilotari in the Search box on the right.) Since then there have been reports of other player-interpreters, but none so interesting as the one just forwarded to me by Prof. M. G. Torres of the University of Malaga (see Sources below). 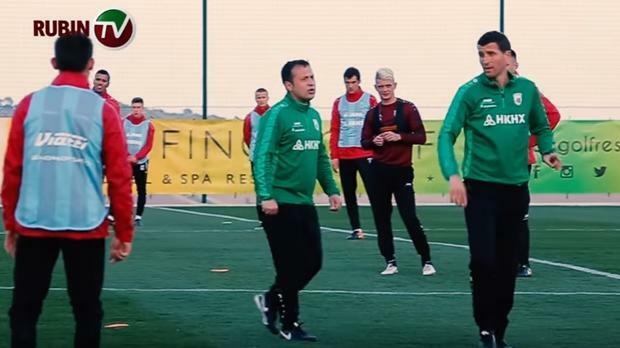 It's about a Spanish football trainer, Javi Gracia, who has left his team in Malaga to go and work for the Rubin Kazan team in Russia. To enable him to overcome the language barrier, the Russian club has provided him with "a top-class interpreter". As the photo above illustrates, the interpreter's job entails not merely interpreting on his feet but interpreting on the run. And there's also a video accompanying the report that's even more interesting because it shows the Russian's interpreting style. It's a style I've only seen before in religious interpreting: to find it enter buea in the Search box on the right. It's the style in which the interpreter not only communicates the verbal message but follows the speaker around imitating the latter's gestures. For want of an established term, let's call this imitative interpreting or interpreter mimicry. Mimicry would be frowned on in conference interpreting, court interpreting, etc. In an old UNO film (see Sources), there's an anecdote about a United Nations Russian interpreter in New York who, every time Nikita Khrushchev thumped on his desk during a speech, would do likewise on the table in the booth. The colleague who tells the story concludes disparagingly, "He used to be an opera singer. He was quite a ham." But in circumstances where the speaker is intending to be rousing or inspirational, interpreting in a neutral, disengaged style may be a betrayal. Another sports report has also reached me, but about a different sport and interesting for another reason, namely the information it gives about the interpreter's background. "Translator [sic] Josue Peley was playing in Quebec City, still dreaming of the big leagues, when the Blue Jays called with an offer came he wasn't expecting." The Blue Jays are the Toronto Blue Jays, a top team in the American League East. First his multilingualism. He's an immigrant, a "Venezuelan-born Montrealer fluent in three languages," Spanish, English and French. He's 29 years old. "Peley moved from Venezuela to Montreal at age 11 and attended Seminole State College in Oklahoma on a baseball scholarship before the Pirates drafted him... From 2012 to 2015 he played with the Capitales de Québec, where he no doubt improved his French." The event that changed his professional life came last year. There 's a long tradition of Latin American players in MLB (Major Baseball League) teams. 25% of MLB players are from Spanish-speaking countries. "For years the major leagues have been getting by with bilingual team mates and coaching staff when there was a need for interpreting for Spanish-speaking players. The unwritten policy of just 'getting by' at practice, team meetings and press conferences belies the current status of professional baseball… with the average team value reaching $1.2 billion." So in January 2016 the MLB authorities issued an order that all teams with Spanish-speaking players must hire a professional translator and the Blue Jays found Josue. Note first that for many years the teams had been 'getting by' with natural translators. Second, that the people like Josue who were hired had not gone through professional interpreter training but were chosen for their bilingualism and their knowledge and experience of the game. They are 'professional' in the sense that interpreting is all or part of their job and that's what they're paid for. But even now "his job often includes playing catch or pitching batting practice." "He helps bridge the cultural gap between the Latin-Caribbean countries that produce many major-leaguers and the English-speaking, conservative, largely white American baseball culture… While multilingualism is a pre-requisite, Peley says his most useful tool is empathy." Meanwhile yet another interpreter's biography that's just come this way tells how it was before the MLB instruction (see the Noah Frank reference in Sources). It's rich in detail. The player-interpreter is Ernesto Frieri, a Colombian who taught himself English with determination when he arrived as a rookie in the USA.
."Six years later… Now he's jumping in to help other teammates… When Durango is named Player of the Game and has a microphone thrust into his face for a postgame interview, it's Frieri who comes to his rescue, unprompted, translating on the fly in heavily accented but nearly perfect English." This is how it still is in many teams today. El duro trabajo del traductor de Javi Gracia en Rusia (Hard work for Javi Gracia's interpreter in Russia). ABC Deportes, 22 March 2017. Click [here] or go to http://www.abc.es/deportes/futbol/abci-duro-trabajo-traductor-javi-gracia-rusia-201702221402_noticia.html. United Nations Organization. Other Voices. New York: United Nations Film Services, c1975. 16 mm film, 27 mins. Barry S. Olsen. Professional baseball, globalization and the need for professional interpreting. InterpretAmerica Blog, 11 February 2016. Click [here] or go to http://www.interpretamerica.com/interpret-america-blog/baseball-globalization-and-the-need-for-professional-interpreting. Morgan Campbell. This Jay's big-league job was found in translation. Toronto Star, 18 March 2017. Click [here] ot go to https://www.thestar.com/sports/bluejays/2017/03/18/this-jays-big-league-job-was-found-in-translation.html. Noah Frank. Life on the Farm: the unwitting translator. MLB News, 5 April 1917. Click [here] or go to http://wtop.com/mlb/2017/04/life-on-the-farm-the-unwitting-translator/.